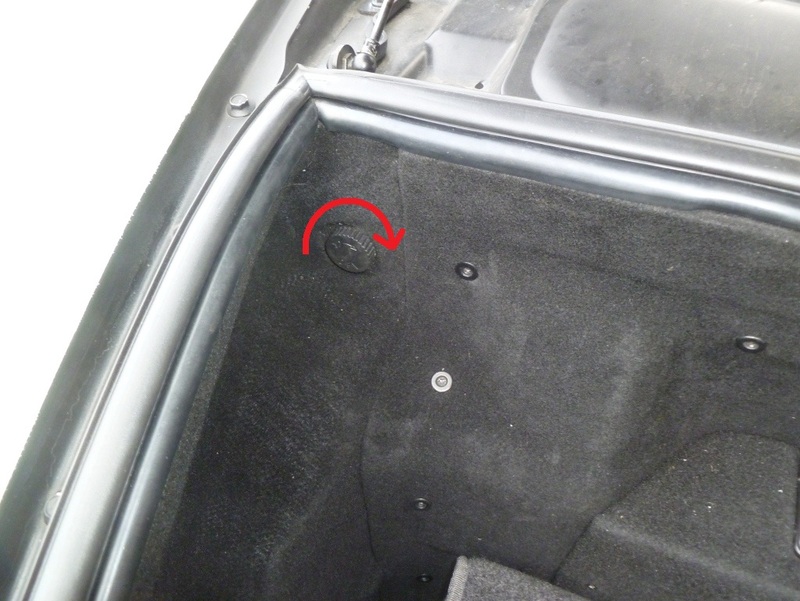 Turn the battery cut off switch clockwise until it clicks – the light inside the boot will go out. 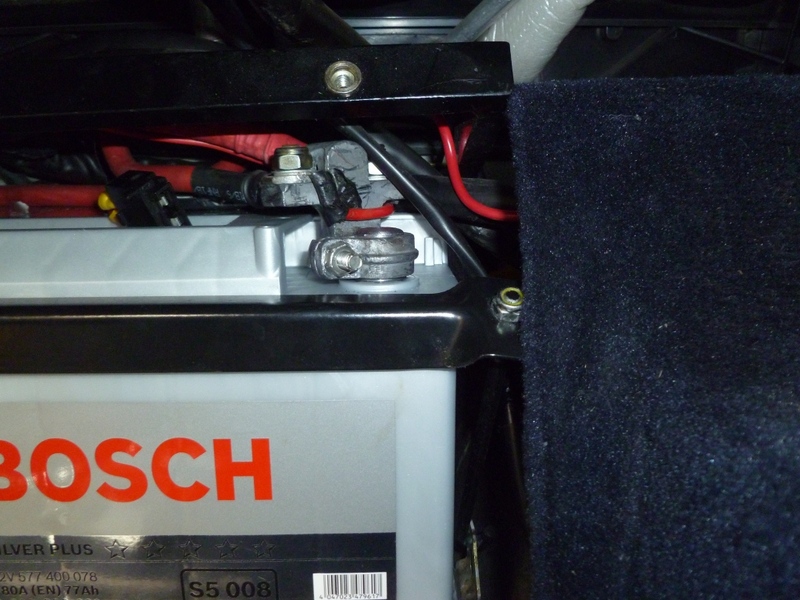 This switch isolates the battery earth from the chassis and makes replacing the battery much safer. Undo the negative terminal first – it is held in place with a 10mm nut. 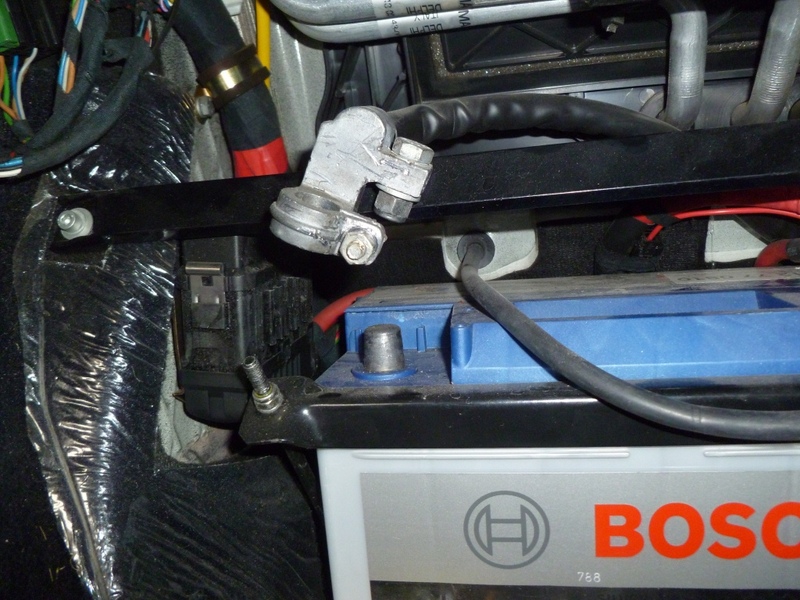 Loosen the nut and removed the clamp from the battery. I prefer to hook the cable and clamp over the metal bar to ensure it does not come into contact with the terminal at all. Now undo the positive terminal (10mm nut). Next undo the two 10mm nuts holding the strap in place. Withdraw the strap to make removing the battery easier. 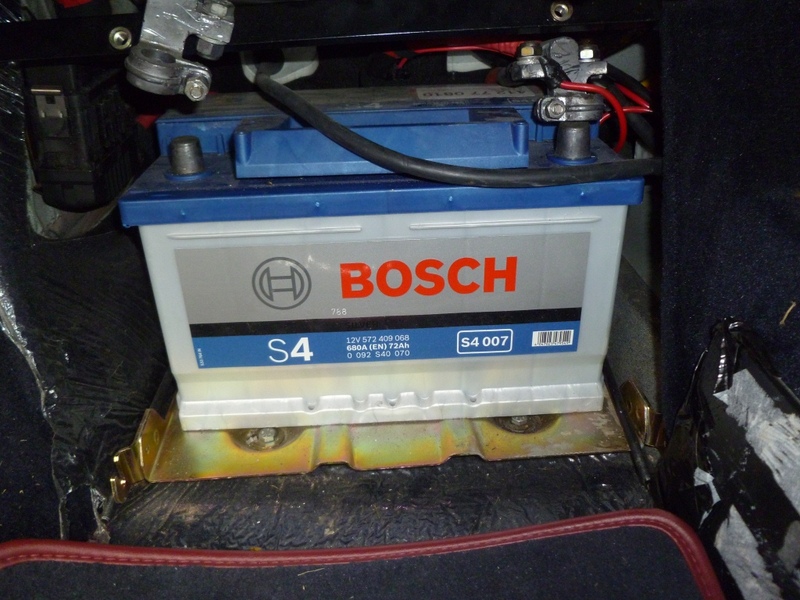 Remove the battery from the car. 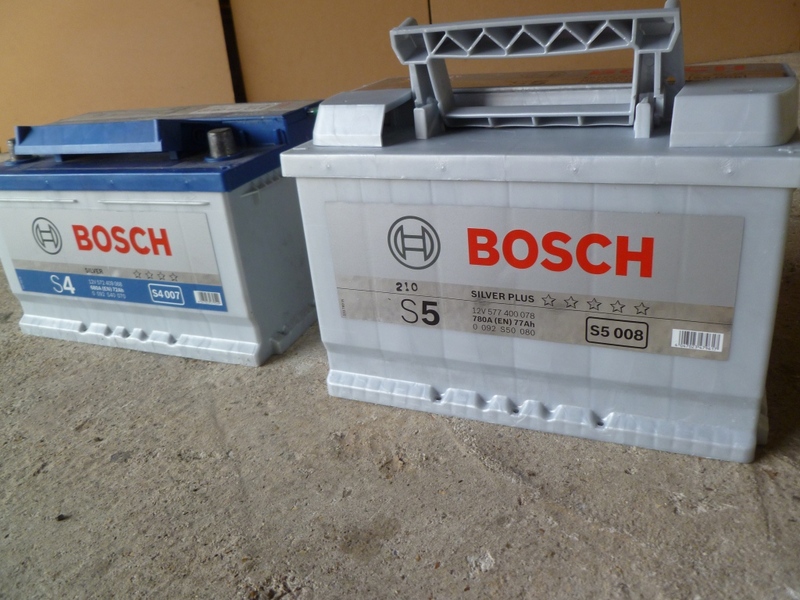 Here are the old and new batteries side by side – note that the old one is the incorrect type and is slightly shorter. 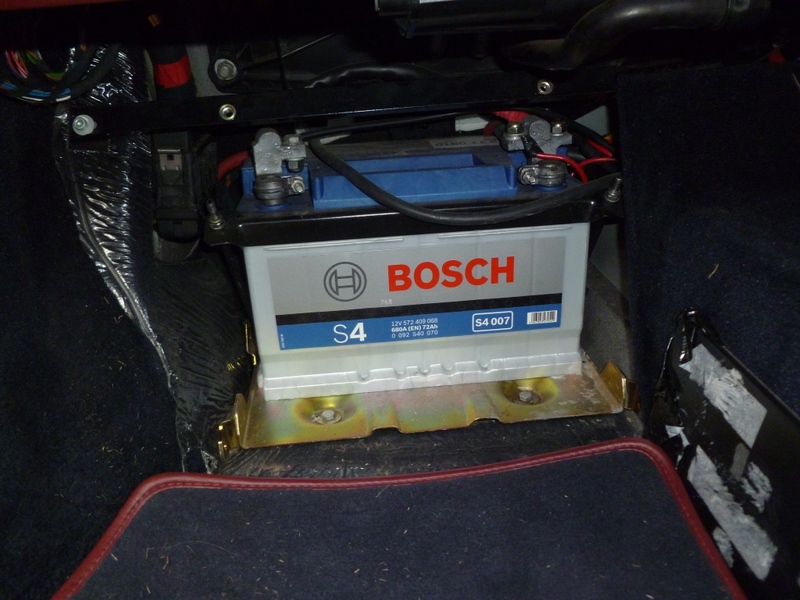 Now slide the new battery into place. 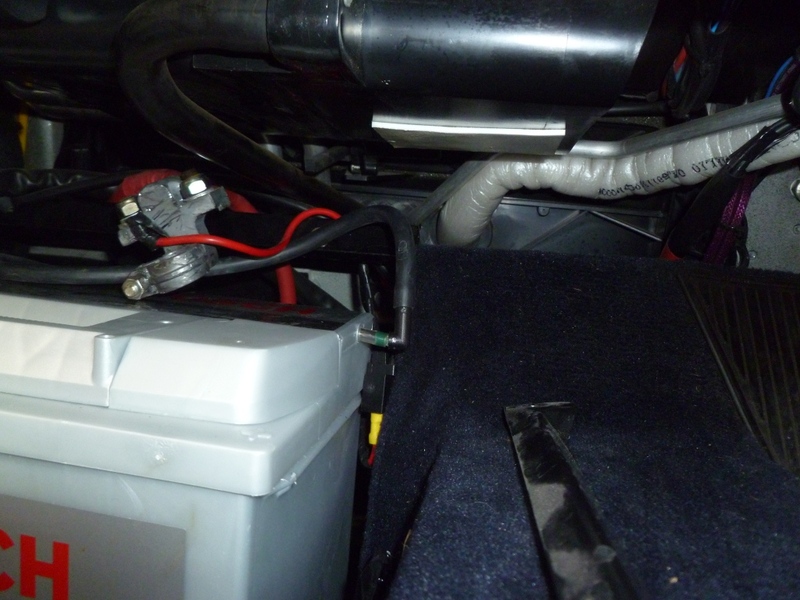 Take care not to crush any cables behind the battery and ensure the vent pipe is fitted correctly. 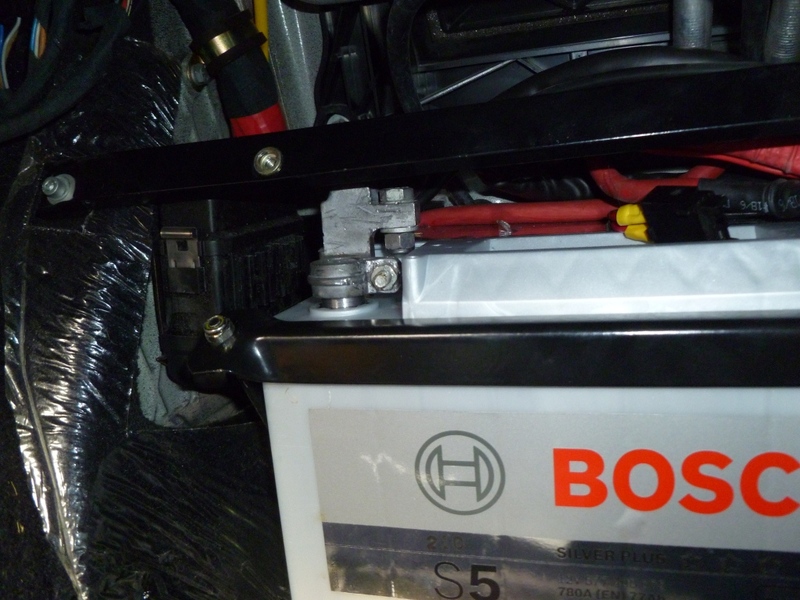 I have shown a picture below of the vent pipe in place with the battery half way in place – in reality you’ll need to push the battery home before fitting. Now fasten the strap into place. 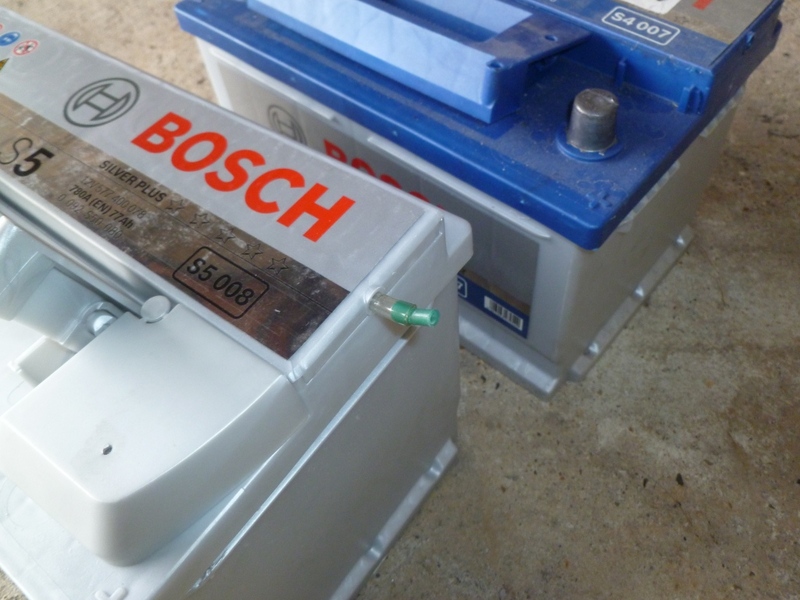 Fit the negative terminal – the alarm will chirp once when it is connected to the battery. 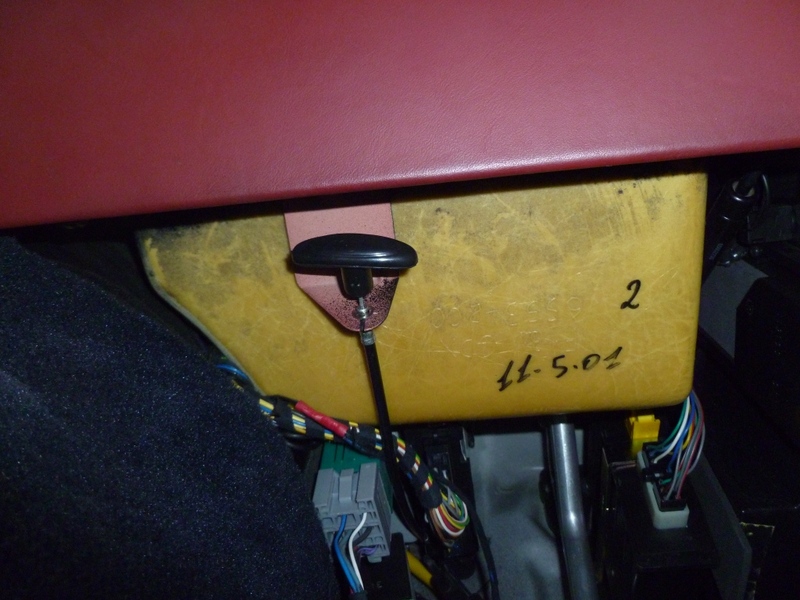 Refit the footrest and turn the battery cut of switch anti-clockwise to engage the power. Make sure you wait 10 seconds with the ignition on but engine off before starting the engine and allow it to idle for 10 mins so it can relearn the adaptive values. Thanks to you I keep learning new things about my 360 and your articles give me the confidence to try some of the service tasks too. 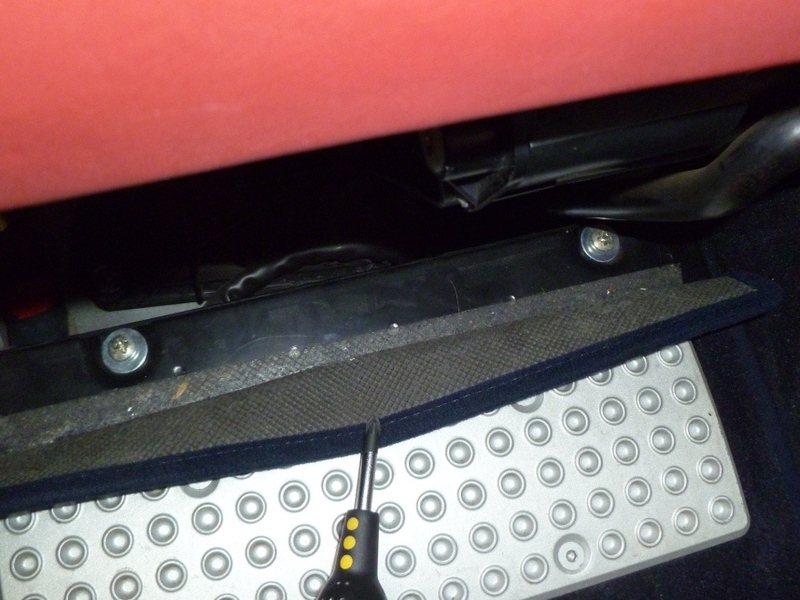 For example I didn’t know that there was battery kill switch in the front luggage compartment. 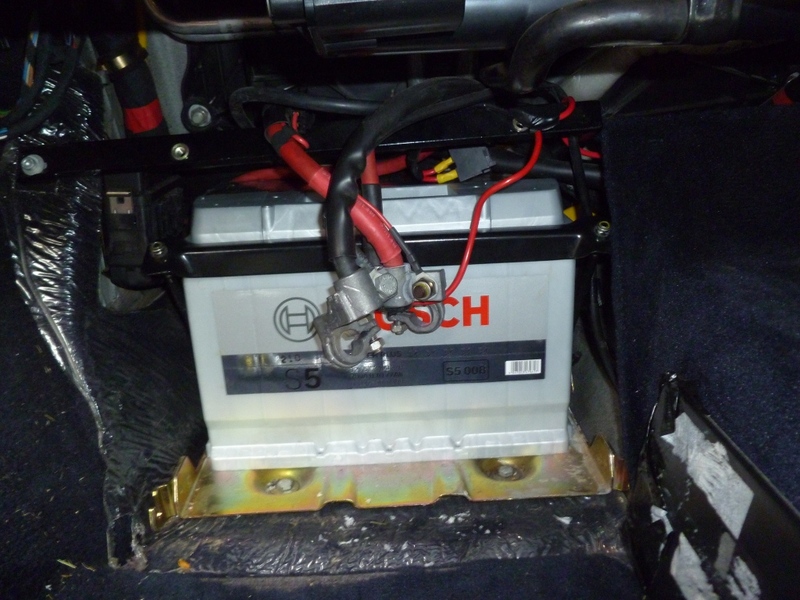 I do use a battery tender (CTEK) but as well this will help when I store the car for longer periods. 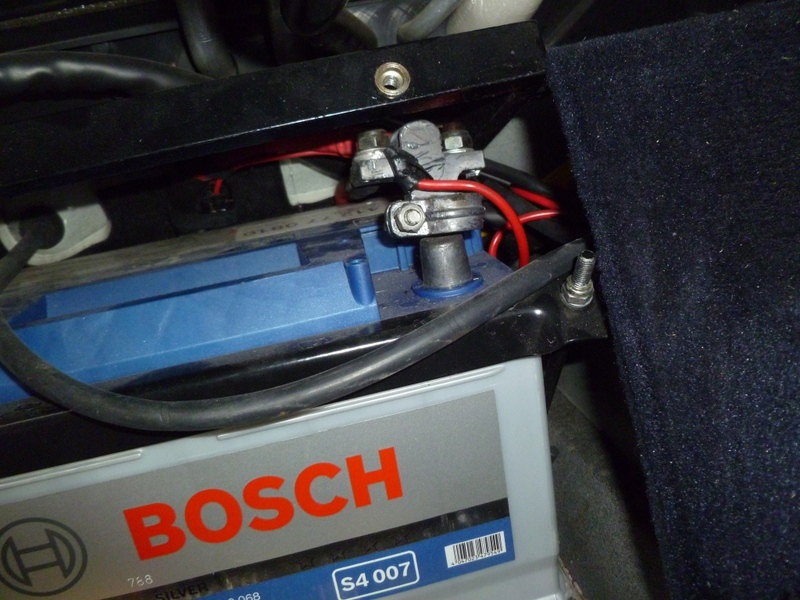 By the way I connected my leads direct to the battery so I can trickle charge it even when the battery disconnect is off. The tail of the lead tucks nicely away when not in use. Thanks so much again for all your brilliant help and advice – it is VERY VERY much appreciated and I have passed on details of your site to others too!